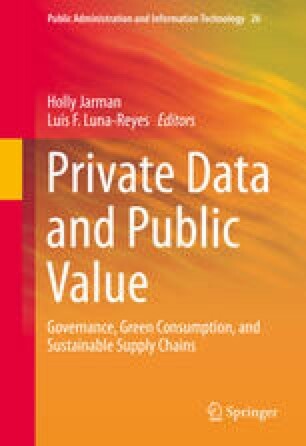 Using data from the I-Choose project, a study of coffee produced in Mexico and distributed and sold in Canada and the United States, this chapter analyzes three distinct traceability systems in relation to the ways in which each attempts to build and sustain trust. In each case, supply chain actors are working together to capture information about how and where their products are produced, aiming to provide this information to consumers. The ultimate goal in each system is the same: to demonstrate the quality of their product and earn a price premium. We find that institutional, calculative, and relational trust are used in different ways in each of the three systems, with distinct variations over time. Extrapolating from these cases, we find that providing consumers with sustainable supply chain information evolves dynamically over time with calculative trust less permanent and relational trust more permanent. Institutional trust appears to be the best way to communicate with consumers in international marketplaces. Albersmeier, F., Schulze, H., Jahn, G., & Spiller, A. (2009). The reliability of third-party certification in the food chain: From checklists to risk-oriented auditing. Food Control, 20(10), 927–935. http://doi.org/10.1016/j.foodcont.2009.01.010. Arora, R. (2006). Product positioning based on search, experience and credence attributes using conjoint analysis. Journal of Product & Brand Management, 15(5), 285–292. http://doi.org/10.1108/10610420610685695. Backhouse, J., Hsu, C., Tseng, J. C., & Baptista, J. (2005). A question of trust. Communications of the ACM, 48(9), 87–91. http://doi.org/10.1145/1081992.1081994. Ba, S., & Pavlou, P. A. (2002). Evidence of the effect of trust building technology in electronic markets: Price premiums and buyer behavior. MIS Quarterly, 26(3), 243. http://doi.org/10.2307/4132332. Burkert, M., Ivens, B. S., & Shan, J. (2012). Governance mechanisms in domestic and international buyer–supplier relationships: An empirical study. Industrial Marketing Management, 41(3), 544–556. http://doi.org/10.1016/j.indmarman.2011.06.019. Delhey, J., & Newton, K. (2005). Predicting cross-national levels of social trust: Global pattern or Nordic exceptionalism? European Sociological Review, 21(4), 311–327. http://doi.org/10.1093/esr/jci022. Eisenhardt, K. M., & Graebner, M. E. (2007). Theory building from cases: Opportunities and challenges. Academy of Management Journal, 50(1), 25–32. http://doi.org/10.5465/AMJ.2007.24160888. Jahn, G., Schramm, M., & Spiller, A. (2005). The reliability of certification: Quality labels as a consumer policy tool. Journal of Consumer Policy, 28(1), 53–73. http://doi.org/10.1007/s10603-004-7298-6. Pan, Y. (2011). Eliminating the cyber “lemons” problem with the e-reputation in e-commerce market: Theoretical model and practice. International Journal of Networking and Virtual Organisations, 8(3/4), 182. http://doi.org/10.1504/IJNVO.2011.039993. Pavlou, P. A., & Dimoka, A. (2006). The nature and role of feedback text comments in online marketplaces: Implications for trust building, price premiums, and seller differentiation. Information Systems Research, 17(4), 392–414. http://doi.org/10.1287/isre.1060.0106. Román, S. (2010). Relational consequences of perceived deception in online shopping: The moderating roles of type of product, consumer’s attitude toward the internet and consumer’s demographics. Journal of Business Ethics, 95(3), 373–391. http://doi.org/10.1007/s10551-010-0365-9. Rousseau, D. M., Sitkin, S. B., Burt, R. S., & Camerer, C. (1998). Not so different after all: A cross-discipline view of trust. Academy of Management Review, 23(3), 393–404. http://doi.org/10.5465/AMR.1998.926617. Saini, A. (2010). Purchasing ethics and inter-organizational buyer–supplier relational determinants: A conceptual framework. Journal of Business Ethics, 95(3), 439–455. http://doi.org/10.1007/s10551-010-0432-2. Saparito, P. A., Chen, C. C., & Sapienza, H. J. (2004). The role of relational trust in bank – Small firm relationships. Academy of Management Journal, 47(3), 400–410. http://doi.org/10.2307/20159589. Shapiro, D. L., Sheppard, B. H., & Cheraskin, L. (1992). Business on a handshake. Negotiation Journal, 8(4), 365–377. http://doi.org/10.1111/j.1571-9979.1992.tb00679.x. Sheppard, B. H., & Sherman, D. M. (1998). The grammars of trust: A model and general implications. Academy of Management Review, 23(3), 422–437. http://doi.org/10.5465/AMR.1998.926619. Smith, S., & Barrientos, S. (2005). Fair trade and ethical trade: Are there moves towards convergence? Sustainable Development, 13(3), 190–198. http://doi.org/10.1002/sd.277. Thornton, L. M., Esper, T. L., & Morris, M. L. (2013). Exploring the impact of supply chain counterproductive work behaviors on supply chain relationships. International Journal of Physical Distribution and Logistics Management, 43(9), 786–804. http://doi.org/10.1108/IJPDLM-09-2012-0298. Viitaharju, L., & Lähdesmäki, M. (2012). Antecedents of trust in asymmetrical business relationships: Differing perceptions between food producers and retailers. Marketing Intelligence & Planning, 30(5), 567–587. http://doi.org/10.1108/02634501211251061. Zornoza, A., Orengo, V., & Penarroja, V. (2009). Relational capital in virtual teams: The role played by trust. Social Science Information, 48(2), 257–281. http://doi.org/10.1177/0539018409102414.